You know MoldHold as the only product of its kind for source containment on mold remediation jobs. But MoldHold does more than just mold. Our products are designed to handle a wide array of airborne contaminants. Contractors around the world who deal with asbestos use our MH Containment Barriers for an added layer of safety and convenience in their removal projects. These positive properties led to the popularization of asbestos in protective gear that needed to be fireproof, or any building materials that one might want to be fireproof. Use of the material became so prevalent that asbestos was at one time known as the “miracle mineral,” due to how apparently useful it was to everyday life. Sadly, the “miracle” was short lived, as connections to health risks eventually began to be made, to the point that by today, some countries have outright banned the use of asbestos, with many restrictions existing in the United States. 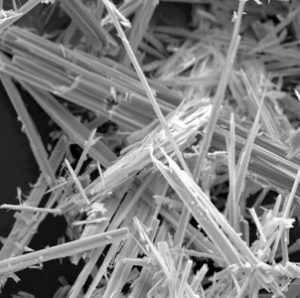 By now, it is widely known that asbestos exposure has links to various health hazards, links that have been suspected since the early 1900s, but were later to be confirmed, including links to cancers and other lung issues. As a carcinogen, asbestos exposure has been linked not only to cancer of the lungs, but also mesothelioma, a cancer that while somewhat rare, affects the membranes that line the chest and abdomen. Aside from cancer risks, other risks include asbestosis, a condition that causes inflammation of the lungs, leading to everything from coughing and shortness of breath to lung damage that is more permanent. As though the risks themselves aren’t scary enough, there’s more. Asbestos, in all its forms, is tasteless, odorless, and impossible to confirm the presence of by sight. If asbestos is suspected, professionals should be brought in to obtain samples and test them in a lab. The abatement team arrives, outfitted with respirators, gloves, and disposable suits. The affected area is completely sealed off, including doorways, windows, and even air ducts, and warning signs are posted for the duration of abatement. High-efficiency particulate arrestance (HEPA) filters are installed and used to not only filter the air in the affected area, but also prevent air from escaping into the rest of the building. The affected materials (flooring, walls, etc.) are cut out of place and into manageable pieces, and all debris is vacuumed into plastic bags for disposal. Before the larger pieces can be removed, they must be sealed up, either with plastic and tape or a product such as MH Containment Barrier (for more complete, constant containment), to keep asbestos from escaping into the air during transport to specially designated dumpsters designed for the disposal of asbestos. Once the abatement team has finished the job, they must get in a shower (normally brought to the site) to decontaminate themselves and dispose of the suits they had been wearing during the abatement. MH Containment Barriers are already being used by professionals to protect themselves and property owners during the removal of asbestos; they are easy to apply and provide a direct barrier to the entire affected area that will effectively minimize asbestos exposure during transport. If you would like more information on our containment barriers and how they can help you minimize exposure to asbestos, as well as a host of other contaminants, contact us today.